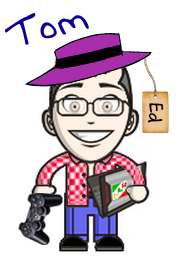 Can you believe it’s been sixteen months since the site’s last Hi-Score Duel? Chris and Alan’s showdown on Super Castlevania IV reached epic proportions, so perhaps we all needed a bit of a breather. But now, it’s the perfect time for a Duel on perhaps one of the most significant games in my life. Crash Bandicoot 3 was the first game I ever played, and it has a very special place in my heart because of that. So when I challenged Tom to three stages of Bandicoot battling, you knew it was going be yet another close, intense duel. Taking advantage of CB3’s time trial system, the challenge here will be to complete three of the game’s levels as fast as possible under Time Trial conditions. 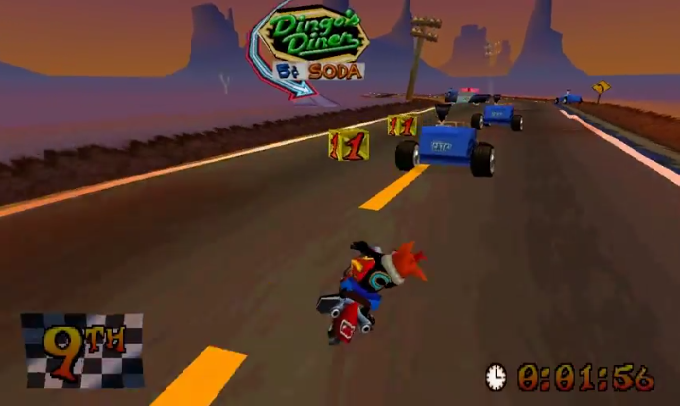 The three levels offer a nice diversity of different level styles, with platforming, tiger riding and racing. And it will test our patience, endurance and skills, and whether it’s worth grabbing that one extra time box. Rules: The three levels will be the following: Level 3 (Orient Express), Level 6 (Gee Wiz) and Level 22 (Orange Asphalt). The winner will be the individual with the fastest combined time across all three events. The challenge will take place from 12pm on Friday 30th January, and finish midnight Saturday 31st. Both players have the full complement of skills unlocked (including apple bazooka and sprint capabilities), and no cheat codes are allowed. 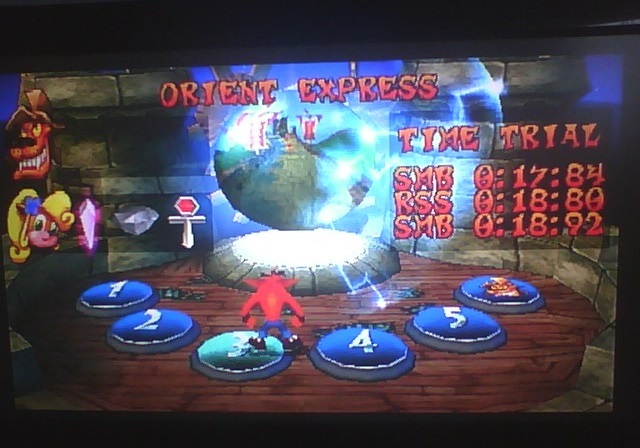 Being one of my fondest memories of Crash 3, I opted to start with Orient Express, also figuring it’d be a nice warm-up being an early level in the game. After realising I was sucking because I wasn’t sprinting, the focus then turned to, essentially, nailing the level in and out. The key here was to grab every single box, otherwise the coveted Platinum relic wouldn’t be earned. It took a few attempts, and some hair-ripping frustrating with the middle section, but eventually I got all the time boxes and earned that Platinum with a time of 17.84. 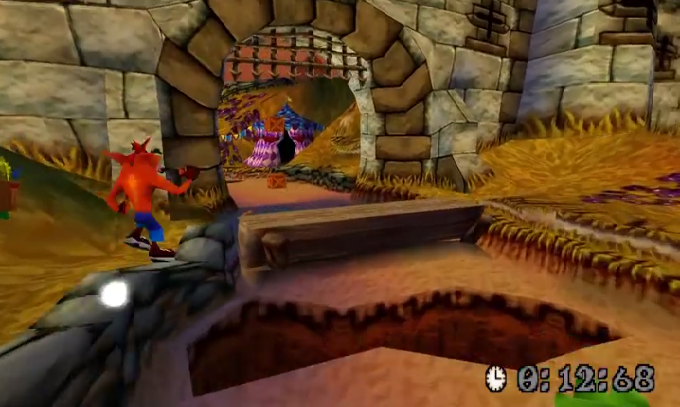 Crash Bandicoot 3 was a massive time-sink for me in the late nineties, one of the PlayStation’s most moreish platformers, and Orient Express epitomised its quick-fire appeal. A brief, breathless charge featuring Crash’s sister Coco on the back of an uber-cuddly tiger, the level required precision timing above all else. Whilst enemies posed little threat, maintaining a sprint and timing leaps onto bounce boards offered little margin for error, with one rooftop charge granting four seconds worth of bonuses – though I never cracked being able to get both the one and three second bonuses together whilst maintaining top speed. 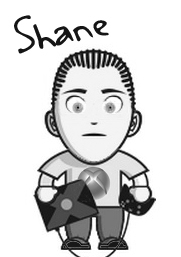 I sensed because of the brevity of the level that future rounds would likely prove more decisive, and having shaved a few tenths ‘n’ hundredths here and there, I didn’t feel I would concede much to Shane with a time of 19.12 seconds, even though I felt I must have missed a trick in failing to earn a Platinum relic. Next up, Gee Wiz. This level is a pain because of the Wizards, who shoot projectiles at you and turn you into frogs. In fact, finishing Gee Wiz is probably harder than earning a good time, as there’s very few time boxes in the level. But when you combine the awkward holding of the sprint button, several tough foes to dodge and a chokable ending where nitro boxes can spell your demise, Gee Wiz brings a different kind of challenge to the table. I actually earned Platinum on my second go, but figured it’d be worth trying to shave some more time off, and eventually I managed to whittle it down to 1:01:56. The only traditional platforming level in our Duel meant Gee Wiz offered a range of challenges. Running along the little stone walls proved a handy way of passing by enemy attacks without so much as a pause, and taking out some of the time boxes smoothly required quite a bit of trial and error. 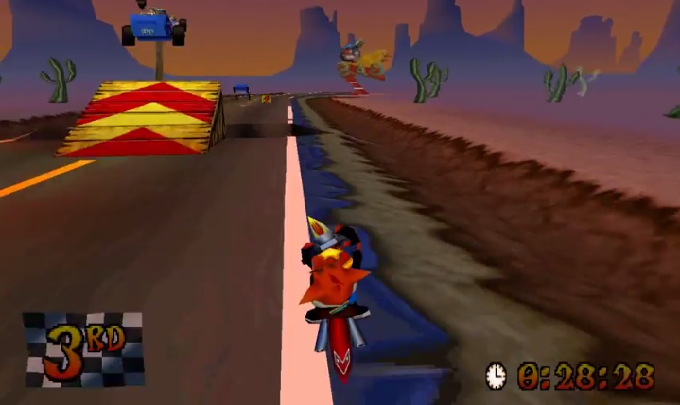 The most decisive trick was to retain at least one Aku-Aku mask for the end, where it was possible to save time by jumping straight at the nitro boxes (a tactic that usually results in squandered time and/or dead Bandicoot), because the level ends almost instantaneously after doing so. Beating the platinum and then improving my time by more than half a second in the final session was encouraging, finishing on 59.84 seconds. So last, but certainly not least, was Orange Asphalt, a race pure and simple. Here, it felt like a tough balancing act of getting the time boxes, avoiding police cars driving back and forth and – perhaps most difficult – dealing with the rather aggressive enemy AI, who repeatedly killed my high score runs by knocking me off the track. Grr. After several attempts and some frustrating close-runs, I ended up with a score of 1:26:52. No platinum on this one, so fingers crossed Tom hasn’t kicked my arse on this one. From first session to last, I improved my time on Orange Asphalt by 11.9 seconds. It’s a mark of the risk ‘n’ reward nature of this lengthy, incident-packed course, and the need to extract every last ounce of performance. Avoiding the opposition and traps proved tricky though it could to a certain degree be predicted after numerous attempts, but what made the difference ultimately were the speed strips. 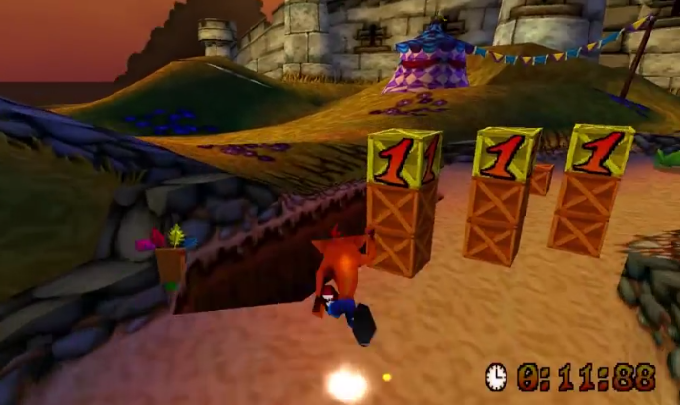 The key is Crash would not slow down after hitting a speed strip until he either crashed, hit an opponent or went up a speed ramp. For one single run, the second speed strip sent me miles as I somehow avoided firstly opposition and track verges, and miraculously (and I have to admit, quite accidentally) avoided the road works and jumps by fitting the bike between the edge of the road and the ramps. Suddenly very nervous not to screw up a run that was miles fastest than my previous, I took the last sections more cautiously, taking the long way round a police car (whilst still nearly managing to hit it) and crossing the line in 1:21:68, a whopping two and a half seconds faster than my next-best run. This gave me a huge boost, as surely Shane couldn’t work the same miracle? Nuts. I knew Orange Asphalt would let me down. Nonetheless, another very close Duel and one which was incredibly fun to be a part of. Really proud of how well I did on Orient Express, and Gee Wiz could have been won by a straw. Well done to Tom on another victory, and here’s hoping the four of us can compete in many more in the future. As Tom and I realised, these sorts of games make for very, very fun duels. A superb battle, and kudos to Shane for making it another close run thing – as he rightly points out, the racing level proved the difference in the end, as we were almost dead-even after the first two levels. His time on Orient Express was a bit of shock, as I felt sure I'd only yield a few tenths. Just goes to show, you can never take anything for granted. A bit of good fortune on Orange Asphalt made the end result look a little more comfortable than it was. But for that one zany run, the margin of victory would only have been a couple of seconds which, over the course of three full levels, is nothing at all. I had great fun returning to CB3 after nearly fifteen years away; it's still a tremendous game, and I’m happy that our Duels see us tackling these games as they were meant to be. Striving to squeeze a slightly faster time, or fractionally higher score, has brought out the best in some cracking stages. With that in mind, I'm itching for more!